NSW Greens resources spokesman Jeremy Buckingham welcomed the Department of Planning’s recommendation to the Independent Planning Commission that the proposed Hume Coal mine near Berrima is ‘not in the public interest and should not be approved’, but said that NSW needed a coal strategy to deal with the issue of new coal mine applications and phasing out coal in a strategic way. “This is a strong rejection of the proposed Berrima coal mine echoing the concerns that the local community have held for many years. “It’s a pity it has taken almost eight years and the eve of an election to arrive for the government to finally knock this bad mine on the head. The local MP Pru Goward failed to stop this mine progressing through the planning system despite widespread concern, even when she was planning minister. “The tide has well and truly turned on coal in an age of climate change. “NSW now needs a comprehensive coal strategy that should forbid any new coal mines and implement a strategy to phase out coal mining over the next decades with transition plans for the regions involved. The Greens will introduce an amendment to the NSW Government’s National Parks Bill in State Parliament today to declare the Jilliby State Conservation Area a National Park and protect the Central Coast’s drinking water catchment from the Wallarah 2 coal mine. If the amendment is passed and Jilliby SCA gains upgraded protection as a National Park, it would prevent the Wallarah 2 Coal Project, a longwall coal mine proposed for directly beneath the Central Coast’s drinking water, from going ahead. A separate amendment will also seek to declare Wyong State Forest as part of the ‘new’ Jilliby National Park. Mining is outlawed in National Parks. The Wallarah 2 mine has faced long-standing local community opposition and the NSW Government’s own Planning Department found the site was sensitive to the Central Coast’s water supply. Greens MLC and Resources Spokesperson Jeremy Buckingham said both the Liberal/Nationals and Labor had in the past promised the community they would oppose the Wallarah 2 mine, now they should act to deliver this protection. “The controversial Wallarah 2 coal mine project poses massive threats to the future of the Central Coast’s drinking water and it’s ludicrous the plan hasn’t been thrown out before now,” he said. “The IPCC report from last week was a call for action – the world must end coal by 2050 for a chance of keeping global warming below 1.5 degrees. This means the government should not approve any new mines, let alone Wallarah 2 that threatens essential drinking water for the Central Coast community. “The Greens have listened to the local community and will introduce an amendment in State Parliament aimed at declaring Jilliby State Conservation Area a National Park and stopping Wallarah 2 from going ahead. “Central Coast Labor MPs Emma McBride and David Harris asked for Federal Government intervention to stop the mine. “Prior to the 2011 NSW election, then Liberal leader Barry O’Farrell famously stood before a rally of residents on the Central Coast and gave a ‘no ifs, no buts’ guarantee there would not be any mining in any water catchment. “The NSW Government broke its promise and betrayed the community but it can do better. “Both parties should take this chance provided by the Greens six months out from the State election of creating a valuable new National Park and putting a stop to Wallarah 2. If they can’t, then they should step aside for leaders who can better represent the interests of the Central Coast community over the vested interests of coal,” Mr Buckingham said. • Greens introducing amendment to NSW Parliament to expand the National Park reservation estate to include the 12,159 hectares of the Jilliby State Conservation Area. • Jilliby SCA provides critical habitat for over 150 native animal species, including 16 threatened species and more than 130 species of birds. It has outstanding natural values consistent with stronger protection as a National Park. • If Jilliby SCA was upgraded to National Park protection, it would protect integrity of the water catchment that supplies drinking water for the people of the Central Coast – a projected population of almost half a million people (415,000) by 2036. In perspective, that’s a population greater than the whole of the ACT. • The amendment will prevent the Wallarah 2 Coal Project, a longwall coal mine directly beneath the Central Coast’s drinking water, from going ahead. • The Wallarah 2 Coal Project (W2CP) will involve operate for the next 28 years, in direct contravention of the IPCC report’s warning that for an end to coal by 2050 for a chance of keeping global warming below 1.5 degrees. • Such is the risk posed by climate change that NSW should not be approving any new coal mines, let alone coal mines that threaten vital drinking water catchments. The next Liberal Government will ensure that mining cannot occur here. It will ensure that mining cannot occur in any water catchment area and will ensure that mining leases and mining exploration permits reflect that common sense, no ifs, no buts, a guarantee. • In 2014, the Greens introduced a bill into NSW Parliament to enact the Liberal Party promise to stop the Wallarah 2 coalmine, but both the government and the Labor opposition refused to even allow debate on the bill. • Seven years later, all parties now have an opportunity to deliver on this commitment to the people of the Central Coast through the inclusion of Jilliby. The Greens have challenged NSW Labor to heed the warning contained in the IPCC Special Report released yesterday and rule out the approval of any new coal mines in NSW. The international consensus report found coal use for electricity must be virtually eliminated by 2050 if the 1.5-degree limit is to be met. On the same day, the NSW Department of Planning recommended the approval of the new Bylong coal mine in the Hunter Valley. There is currently 1,881 million tonnes of coal either recently approved or in the planning pipeline in NSW. 778 million tonnes are from new mines, with 1,103 million tonnes from proposed expansions to existing mines. 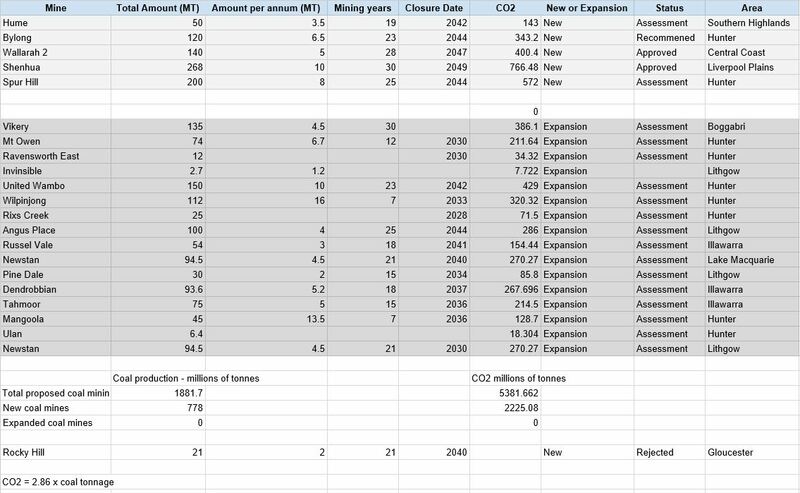 If all this coal were mined and burnt it would emit 5,381 million tonnes of C02. Greens NSW Energy and Resources spokesperson Jeremy Buckingham said, “The 778 million tonnes of coal proposed from new mines in NSW is a massive carbon emissions bomb poised to wreck our future. “The IPCC made it clear that to avoid more than 1.5 degrees of global warming, most coal will need to stay in the ground. “The vital question is whether NSW Labor is prepared to make the necessary decision to phase out coal. Will Labor recognise the scientific necessity and reject proposals for new coal mines or significant expansions of existing coal mines in NSW? “The decision recklessly ignores the international scientific consensus that we need to end coal for a chance of keeping climate change impacts at safer levels. “Meanwhile, the State Government is suffering policy paralysis on climate action. It has outsourced energy policy to the Federal Government, content to watch as climate deniers and the mining lobby hijack energy policy in a desperate bid to keep fossil fuels in the mix. “Energy Minister Don Harwin continues to trot out the NSW’s net-zero emissions target by 2050 as the answer to everything, despite rising state emissions and no path for reaching the goal. “The new report also shows the timeframe of 2050 misses the mark – parts of the NSW coast will be underwater, our agricultural sector will be shot and natural disasters will be on the rise without bold action. “The next few years will lock in the future of our community and planet. If NSW’s current political leadership won’t take the urgent climate action needed, then they should stand aside for leaders who can. “Labor should lift its ambition, listen to the community and work with the Greens for a safer, better climate future for NSW,” he said.